Goodreads says, "Seventeen-year-old Amy joins her parents as frozen cargo aboard the vast spaceship Godspeed and expects to awaken on a new planet, three hundred years in the future. Never could she have known that her frozen slumber would come to an end fifty years too soon and that she would be thrust into the brave new world of a spaceship that lives by its own rules. Amy quickly realizes that her awakening was no mere computer malfunction. Someone--one of the few thousand inhabitants of the spaceship--tried to kill her. And if Amy doesn't do something soon, her parents will be next. Now Amy must race to unlock Godspeed's hidden secrets. But out of her list of murder suspects, there's only one who matters: Elder, the future leader of the ship and the love she could never have seen coming." Amy is frozen cargo aboard the spaceship Godspeed along with her parents. 300 years down the road she will awaken on a new planet and her parents, along with many others, will work diligently to make this new planet their home. However, Amy was "unplugged" fifty years too soon and is unfrozen so abruptly that it almost kills her. No one knows who woke her early and to make matter worse, she can't unfreeze her parents as they are too important to the mission, which is still 50 years away. Amy finds herself on Godspeed surrounded by people very different from herself. In fact, with her bright red hair and pale skin, they think she is a freak, thanks to Eldest, the commander of the spaceship's opinion of her. She wonders if she can trust Elder, the teenager who is training to one day take Eldest's spot. Amy must figure out who is trying to kill the people frozen aboard the ship and in doing so, she encounters more deadly secrets about life on Godspeed. 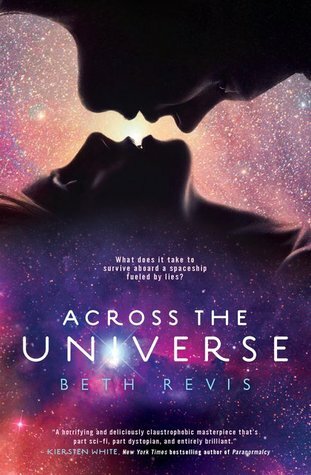 Across the Universe by Beth Revis is a nail-biting debut that will captivate even the most reluctant reader. This novel demonstrate how fascinating science fiction can be at its best. When I read the first chapter, I kept squirming with disgust. It described the freezing process and Revis was so descriptive, I could visualize the whole process. It was so vivid; I even had a dream about it! Needless to say, at that point, I was immediately hooked and read the book in one sitting. Revis does an amazing job really developing the setting of the ship. It was easy to empathize with Amy and feel her loneliness out there in the vastness of space. It broke my heart to watch her desperately need her parents who were frozen below in cargo. The whole concept is mind-blowing! Also, Revis creates an unforgettable environment aboard the ship; I love how she combined elements of sci-fi, romance, dystopia, and mystery all together. It made the perfect recipe for an edge-of-your-seat read that will leave readers guessing. In fact, I think Revis made science fiction more accessible to young adults, and dare I say it.....maybe even cool! Amy's relationship with Elder really grew on me. It was believable and I enjoyed both characters. At first I was worried since each chapter switches from Elder's viewpoint to Amy's, but Revis managed it expertly. I actually prefer how it switched between both characters, because it made the mystery that much more enjoyable as each character slowly put together Godspeed's missing puzzle pieces. Across the Unvierse was full of so many mysteries; I am dying to figure out what happens in book two, which thankfully comes out next year. The ending, in typical trilogy fashion, was heart-pounding. I was desperately flipping the pages. Already I can tell that this will be one of my favorite reads published in 2011 and if any of the 2011 debuts are like this book, I think it's safe to say that we are definitely in for some incredible reads this upcoming year. I'm looking forward to this one. It doesn't release over here until March, so it's still a way off, but I read the first chapter a while back, and I was hooked and definitely left wanting more. Good to know there is a little romance too! Full of mysteries? Sweet! I'm SO sold. Excellent review :) I want to read read Across the Universe so, so badly! Definitely going to buy this one!!! I love that it's really vivid. I've never been a fan of sci-fi, but Beth Revis will probably make me a fan after I read this. I can't wait until it's out. Wow, this sounds amazing! Can't wait to get lost in this world when I eventually get to read it!